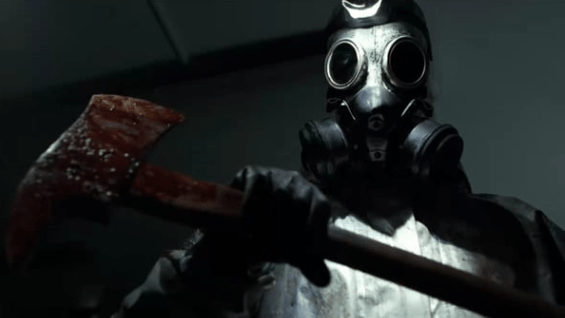 Written and directed by Lou Simon, and released in 2013 under the title HazMat, Hazard is your run-of-the-mill modern day low budget slasher. Everything is played out ‘by the numbers’. But hey, nothing is wrong with ‘more of the same’ right? Except, right from the outset, Hazard is a bad movie. Jacob (Norbert Velez) is portrayed as a energetic but ultimately disturbed character who is obsessed with the chemical plant where his father was killed; a plot point that is never mentioned in any sort of depth within the film. He believes that the chemical plant is haunted, which inspires his friend Adam (Reggie Peters) to contact a reality TV show known as Scary Antics that aims to scare “chumps” for laughs and ratings. Do you remember Scare Tactics, originally broadcasted on the Sci-Fi Channel/Syfy? It would appear that director/writer Lou Simon also remembers the hidden camera TV show, copying the concept and pasting it into Hazard with very little changes. Yes, the amount of originality is 0.5 (out of 11) on the slasher subgenre scale. Did I mention Hazard was a bad movie? Not even a loveable ‘so bad it’s good’ movie. Just downright bad. ‘Scary’ Dave (Todd Bruno) and his TV crew quickly set up their equipment in the now abandoned chemical plant, liaising with Adam on the plan to prank Jacob. The idea was for Adam (and a few so-called friends) to invite Jacob to the chemical plant and break in. Once inside the group would split up, leaving Jacob alone. That is when the scary antics can begin! Jacob initially believed that the prank was real but soon notices the small hidden camera attached to the dead man’s HazMat suit. Something snaps within Jacob’s mind and soon enough friends and crew members are dismembered at Jacob’s hands, one by one. They can’t escape! Perhaps entering an abandoned chemical plant with limited escape routes was not such a great idea. I’m sure a few health and safety laws have been broken here. And that’s it. Perhaps I’m being too hard on Hazard for it’s flaws? The practical effects were lovably bad and Lou Simon’s direction, whilst nothing spectacular, was functional. The script however is just awful! There is a ‘twist’ nearing the end of Hazard’s 80 minute running time that could have redeemed the shoe-string budget. But it just didn’t work. The ‘twist’ was so poorly tied to an earlier throwaway line that I couldn’t help but laugh. IMDB user Arivero-742-161540 compares Hazard to the first entries in the Halloween and Friday the 13th series. A bold statement indeed, and one can only imagine as to what movie Arivero-742-161540 had actually watched…because it certainly wasn’t Hazard. 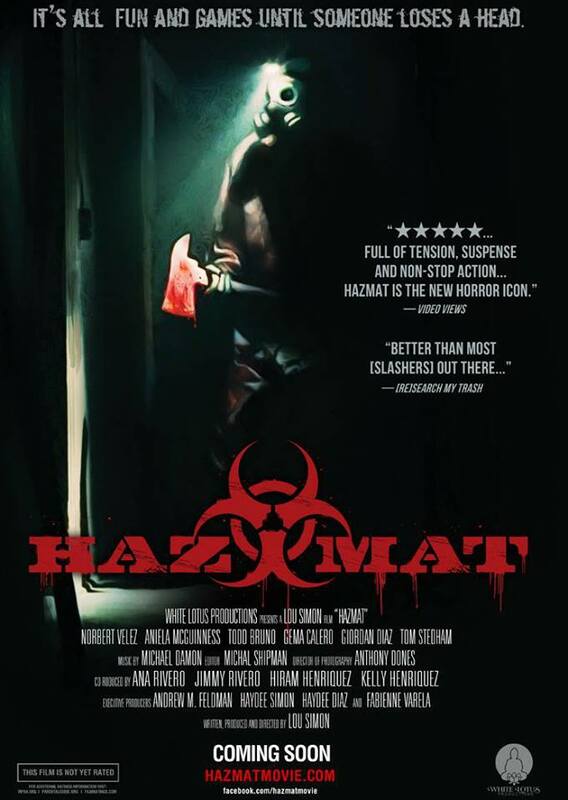 Hazard (2013) aka Haz-Mat, directed by Lou Simon. 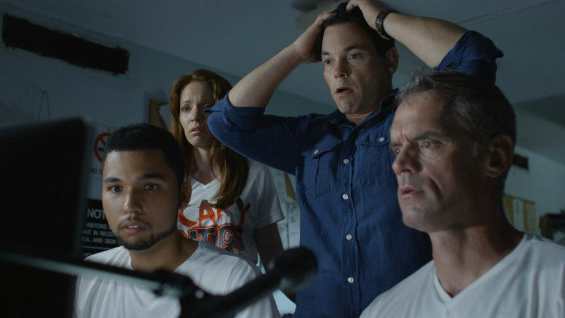 Starring Norbert Velez, Aniela McGuinness and Todd Bruno. Hazard is available on DVD, courtesy of 101 Films. Hazard is also available to buy from Amazon.co.uk ; plus if you decide to make a purchase after following the link provided you will have supported Attack From Planet B, so thank you.